We’d love your help. 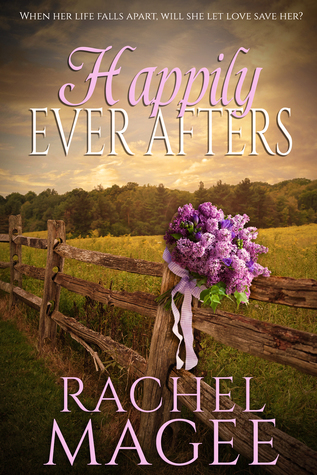 Let us know what’s wrong with this preview of Happily Ever Afters by Rachel Magee. Lainey Stratton does not fall in love with strangers she meets on vacation. It simply doesn’t make logical sense. So when Lainey meets Carter Thompson on the first day of her Caribbean vacation, she knows it could never amount to anything more than a crush. At the end of the vacation she will return to Dallas and he will return to D.C., and that will be the end of it. Well Lainey Stratton does not fall in love with strangers she meets on vacation. It simply doesn’t make logical sense. So when Lainey meets Carter Thompson on the first day of her Caribbean vacation, she knows it could never amount to anything more than a crush. At the end of the vacation she will return to Dallas and he will return to D.C., and that will be the end of it. Well, unless he wants to join her at a friend’s destination wedding, which would be considered vacation too, right? To ask other readers questions about Happily Ever Afters, please sign up. (4.5 Stars) My heart and soul belongs on the beach and the first quarter of the book takes place in Puerto Rico (I've been there, so it was easy to imagine). Lainey and her two best friends, one of which is her sister, are celebrating her 30th birthday and a chance encounter with Carter leaves everyone involved (reader and Lainey) with a palpitating heart. The chemistry is definitely there, but after this long weekend, how can these two successful people from opposite parts of the country possib (4.5 Stars) My heart and soul belongs on the beach and the first quarter of the book takes place in Puerto Rico (I've been there, so it was easy to imagine). Lainey and her two best friends, one of which is her sister, are celebrating her 30th birthday and a chance encounter with Carter leaves everyone involved (reader and Lainey) with a palpitating heart. The chemistry is definitely there, but after this long weekend, how can these two successful people from opposite parts of the country possible make a relationship work? The road to a happily ever after is not smooth. There are many obstacles and hazards to be overcome before reaching your destination. Lainey is a successful Doctor celebrating her 30th birthday when she unexpected meets a handsome bachelor. (When do you ever expect to meet the right guy?) They hit it off from the beginning, but she lives in Texas and he lives in Washington DC. She considers it to be a vacation crush and is prepared to move on. Fortunately, that's not the way this story plays out The road to a happily ever after is not smooth. There are many obstacles and hazards to be overcome before reaching your destination. The book starts out in a tropical paradise where two people meet. All the initial f It's always a bit of a chance picking up a book by an author you don't know and haven't really heard anything about. I do believe this is Rachel Magee's first book and if it isn't, it's MY first book by this author. I was hopeful going in, but unsure. Man, I am SO glad I joined in for this book tour because this book was fantastic. It's more than just a sweet romance, it's a journey filled with emotion and growth. By the cover I thought I was in for a pleasant boy meet girl kind of story but it was more than that. It was the second half of the story that really did it for me. The heroine's pain was believable and heartfelt for me. Rachel Mcgee really knows how to pull on the heartstrings. I loved the relationships she built not just between the hero and heroine but between her and her friends. I would definitely read another story from this author. The road to happiness is sometimes littered with potholes. The ones that hurt. The ones that derail your plans. Lainey Stratton has had some difficult knocks in her life. She is definitely due for some joy. When she goes on vacation with her sister and best friend, she meets Carter Thompson. A vacation fling with a gorgeous guy is just what she needs to celebrate her thirtieth birthday. Yet as she spends time with Carter, she grows to admire the man he is. This book. Wow. The first third was fun. The road to happiness is sometimes littered with potholes. The ones that hurt. The ones that derail your plans. This book. Wow. The first third was fun. A vacation in San Juan, good friends, adventure with a gorgeous guy and meeting new friends. It set me up for a fun romp. And then Pow! Now I’m crying, grieving along with Lainey at her loss, her loneliness, her heartbreak. Through it all, Carter is the kind of guy you just know Lainey needs in her life. The guy who flies out to be her date at a wedding, the guy who takes care of her during her darkest days, the guy who could give her what she longs for. But is Carter the guy Lainey believes him to be or does he hold a secret that could destroy her burgeoning hope? Rachel Magee’s debut novel is moving but, more importantly, it reminds us of the power of falling in love. I LOVED this book! It is such a sweet story with compelling characters, romantic settings and an engaging plot. I was really rooting for the heroine Lainey and the hero Carter. The emotional journey of these two souls captured my heart and stayed with me long after I finished the novel. I highly recommend this debut novel by Rachel Magee and hope to see more of her work in the near future. Lainey Stratton was on vacation with her two best friends to celebrate her thirtieth birthday. She was bemoaning the fact that she still was not happily married, when the handsome Carter Thompson met and asked her on a date. He was only supposed to be a vacation fling. But then he indicated that he wanted to continue their relationship past the vacation, despite the thousand plus miles between them. Should Lainey take the chance to start a relationship with him or let it go lest it never the sam Lainey Stratton was on vacation with her two best friends to celebrate her thirtieth birthday. She was bemoaning the fact that she still was not happily married, when the handsome Carter Thompson met and asked her on a date. He was only supposed to be a vacation fling. But then he indicated that he wanted to continue their relationship past the vacation, despite the thousand plus miles between them. Should Lainey take the chance to start a relationship with him or let it go lest it never the same way her last relationship did? Happily Ever Afters was aptly named. It was a adorably sweet romance with a happily ever after ending. It was not a fairy tale retelling, but it definitely had a fairy tale ending. I love books like this one. Lainey had definite struggles to overcome in her life and relationships. As mentioned in the synopsis, she faced a tragedy that rocked her world. And the pain in her past kept her from trusting easily. Both problems were genuine and well-addressed. I still enjoyed this book very much, though I would be careful about some of the romantic situations. It was sweet and beautiful. I recommend this book to fans of contemporary romance. Really cute love story. You could feel the warmth between Lainey and Carter from the get go. A heartwarming and passionate read. This book is about Carter and Lainey's journey which starts off by a chance encounter in Puerto Rico. Lainey and her best friend and sister are on this trip to celebrate Lainey's 30th birthday. Lainey sees in Carter everything she longs for in a man. Tenderness, sense of humor, but above all he is an amazing friend and she feels relaxed and comfortable when she is with him. It doesn't hurt that he is extremely attractive. Lainey and Carter have chemistry, but L A heartwarming and passionate read. This book is about Carter and Lainey's journey which starts off by a chance encounter in Puerto Rico. Lainey and her best friend and sister are on this trip to celebrate Lainey's 30th birthday. Lainey sees in Carter everything she longs for in a man. Tenderness, sense of humor, but above all he is an amazing friend and she feels relaxed and comfortable when she is with him. It doesn't hurt that he is extremely attractive. Lainey and Carter have chemistry, but Lainey is reluctant to take it to the next level. She had been hurt before and did not want a repeat performance. She did not want to be hurt again. When the trip is over and done, Lainey just believes it was just a crush that would dim when it was over. Not the case. Carter lives in D.C. and she lives in Texas. A long distance relationship is difficult and pretty much impossible to maintain. But they keep in contact by text. I found myself drawn in by this couple as they struggle each in their own way. It was a fast paced read and I wanted to see how it ended. My heart strings were pulled in many directions by this couple. Rachel McGee has a bright future if this book is any indication. I look forward to future books from Rachel. A happily ever after. Isn’t that what all little girls dream about? I don’t necessarily mean a Prince Charming, but just a good old fashion being swept off your feet, romantically falling in love, happily ever after. And when you read a romantic novel, isn’t that what the tone should be? Sure, some stories may be a little bit far fetched, but they are there to provide hope to those who have not began their story yet, right? As a romantic myself, I’d like to think so. Here’s the thing. Happily eve A happily ever after. Isn’t that what all little girls dream about? I don’t necessarily mean a Prince Charming, but just a good old fashion being swept off your feet, romantically falling in love, happily ever after. And when you read a romantic novel, isn’t that what the tone should be? Sure, some stories may be a little bit far fetched, but they are there to provide hope to those who have not began their story yet, right? As a romantic myself, I’d like to think so. Here’s the thing. Happily ever afters can come in all different ways. The important thing if that you are with the person you’re supposed to be with. In this story, we see a young woman (which by the way struck a chord with me because I also had a hard time turning thirty although for different reasons!) who does not think that could happen to her. Enter Professor Dreamy. Okay, so he’s not a professor at the moment, but he was at one time. I felt their connection was genuine and believable. They took things slow, and that made the relationship that much better. I actually liked seeing the texts between them as it broke up the pages a bit. What I didn’t like about this story? The tragedy that happened. I know it’s to make a storyline, but it really upset me. I’m not sure if it’s really because I didn’t see the need for it in the story, or the fact that I felt like part of the family and the tragedy itself upset me. I kind of felt like Lainey’s character had been through so much, and this was just one more thing to wrong in her life. I just wanted her to have something good going on – like her relationship with Carter. Again, I’m pretty sure this is just a biased opinion, nothing against the author’s writing ability! But it did upset me and therefore I am sharing with you. Overall it was a cute story, much like a traditional romance. It was a clean read – although the characters were drinking, and some people may be bothered by that. Having never read something by this author before, I was unsure what to expect, but I found that I enjoyed it and will check out other books she has! I received a complimentary copy of this book. I was not required to write a favorable review. All thoughts and opinions are my own. So, um, maybe the book should have a stronger warning about the tragic turn in Lainey's life? It was very sad. It made the ongoing emotional trauma that she was experiencing very understandable, but kind of hard for me to go through with her. Still, as promised, the happily-ever-after does come. It is quite possible that Lainey and Carter are my favorite book couple. These two are so relatable and real, I felt like I was right there with them every step of the way!